on one of our small group tours. explore the Castles of Poland on our Fascinating Poland Tour. your guided tour will inspire and delight. NEW PRIVATE TOURS FOR TWO! Guided Tour of Warsaw - Are you ready for an adventure in the Capital of Poland? Visiting Poland is never boring, it doesn't matter if you travel through big cities or small towns, you will always find piece of history, a monument to explore and learn about. 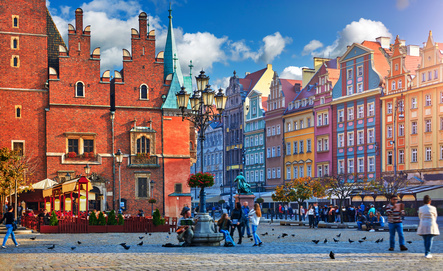 If you've never considered Poland as a destination for a European vacation, you may be a bit overwhelmed at the sheer amount of things there are to see and do on your visit. Whether you are an amateur photographer wanting to fill albums with Poland's intricate architecture, a historian hoping to stand in the locations of events gone by, or a shopper on the lookout for collectibles, you are sure to find a perfect fit in this amazing country. Wondering where to begin as you choose your ideal tour of Poland? Here's a handy list, broken down by activity and city, to help you get started planning your next vacation. Malbork Castle is an epic castle that should absolutely be a part of any vacation itinerary in Poland. The castle was built by the Teutonic Knights in the 12th century and has an amazing collection of weaponry and an ongoing amber exhibit. Malbork Castle achieved even more fame by being designated a UNESCO Heritage site in the late 90s. It is majestic, with beautiful gothic architecture from medieval times, and is the largest castle of its kind in the world. Niedzica Castle features more than exquisite views and architecture. Proudly standing above the lake Czorsztyn, Niedzica castle has had many owners dating back to 13th century. Built by a Hungarian known as Kokos from Brezovica in 1325. 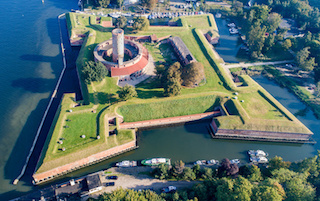 After being abandoned before the end of the war and reconstructed in 1963, the castle serves as a historical museum to this day. It is a great place to visit, and the views from upper levels are absolutely stunning. Booking our “ Fascinating Poland” tour you will visit this castle, and in the warmer months of the year, you will sail the lake and raft down the Dunajec river right below. The Royal Wawel Castle is a gothic castle that has stood for centuries in Poland and is a favorite for vacationers touring Poland. The tombs of the Royal Wawel Castle are fascinating, with many national heroes, artists, poets, and royalty buried in the cathedral. Visitors to Poland love this symbol of Polish heritage. If you like history the capital of Poland is your place to visit. Rebuilt from ashes after World War II, Warsaw surprises many who visit for the first time. With many Palaces, Castles, beautiful parks and gardens, monuments and museums plus architecture, Warsaw is a living statement of greatness, past and present, by reflecting pride and unbroken power in spirit of the polish people. Book our “ Castles & Palaces” tour and get guided tours of Warsaw. Visit the Warsaw Uprising Museum for incredible insight into the honorable and hard-fought battle of Warsaw's people against the Nazis. Also of note, the Historical Museum of Warsaw, which explores the city's history from its founding in the fourteenth century. Located in Oswiecim, Auschwitz Concentration Camp is a sobering but profound journey through a devastating point in world history, as well as the Polish people. Tours of the camp last around three to five hours and include detailed information of the plight of the prisoners and conditions of the camp. Everyone should visit Auschwitz at least once in a life-time, preserved to teach humanity. One of the oldest cities in Europe, centuries ago was the trade point between the West-East & North-South. Tour St. Mary's Basilica in Krakow, a magnificent monument that sits right in the town square. The Krakow History Museum features huge, unique collections and exhibits, including Oskar Schindler's factory and the Rynek Underground. Those touring Poland on vacation will certainly find their fill of history here. One of the most famous and favored market destinations in all of Europe is the Krakow Christmas Market, running for nearly six weeks and packed with goodies, festive lights, music, and events. This is a can't-miss part of Poland's culture and a must for any shopper or tourist. The cloth hall in the middle of the market square is definitely a must-walk through, if Polish souvenirs are in order. With it’s beautiful architecture on the outside and inviting feel on the inside it creates nice atmosphere for easy shopping experience. Although many cities in Poland boast lovely markets for shopping, Wroclaw's Market Square (Rynek) is an exceptional spot for a vacation, especially in winter, when it features an ice skating rink! It's also one of the largest and oldest in the country, with dining and live music in the evenings to accompany your wanderings. Don't forget to add a bit of culture to your shopping trip with a tour of Panorama Raclawicka, which is a finely detailed 360° indoor painting depicting the Koscioszko Uprising against Russian forces at the battle of Raclawice, must be seen to be truly appreciated. If you have ever wondered how world famous Polish pottery is made, then a trip to Boleslawiec and a tour of the pottery factories and shopping is in order. With its origins dating back to the eighteenth century, Polish pottery is uniquely beautiful and highly collectible. Pierogarnia Mandu features delightful pierogi and other authentic dishes in a gleaming restaurant where you can actually watch the dishes being prepared. The food is tasty and representative of Polish tradition, with rave reviews from locals and tourists alike. A trip to Poland is not complete without a visit to its famed "milk bars". Once a staple of the workman's diet, today, they offer affordable, authentic eats. Check out Bar Mleczny Górnik for good eats. Imagine yourself visiting Krakow but wanting to know what Zakopane is all about? All you have to do is have a meal at “Morskie Oko” ( The eye of the Sea ) restaurant. This restaurant is family friendly and reflects the highlanders lifestyle in Zakopane. Enjoy Polish cuisine as you listen to folk music in the evening. The other choice would be the “Pod Aniolami” ( Under the Angels ) restaurant, you can choose sitting at a patio or in a cellar, then just experience fine Polish dining, ( when busy, you may have to wait 30 minutes for your food ). Touring Warsaw can take all day long, to take a little break have a lunch at a lovely restaurant called “Restauracja Rozana” ( Rosy Restaurant), here you may choose to sit outdoors on a patio in a garden or inside. They’re open for lunch & dinner, children big and small are welcome. You may have the pleasure of listening to live piano or guitar music. Also if you are just looking for a quick stop, the coffee shop called Lukullus, with many locations, would be a good choice. Lukullus is a 3rd generation of Jan Dynowski’s family business which started in 1946. With endless choices of fabulous pastries you can’t go wrong.